I've never really finished the porch. I built it, and we just started using it. One day last year I did the floor (which I might do another post on as I'm quite pleased with it) and then I put up a few hooks and we just started using it like a normal room. Shoes are always a nightmare in this house and I wanted more storage for them. 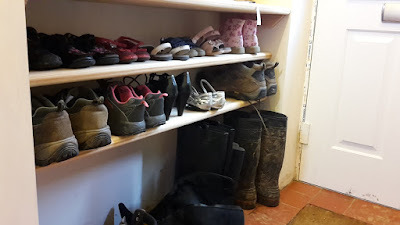 So many pairs of feet and each one has multiple pairs of shoes, boots and wellies! I also wanted a shelf for the eggs to go on instead of having them placed in the dinning room all the time. I let her screw in the screws. She was quite rapid! So one afternoon my middle child and I set about putting up some shelves. I machined the wood the night before (she's too small to manage the planner unfortunately) so all we had to do was mark it all out and, drill the holes and screw it all together. The wood was some I had saved from being burnt on a big job about 10 years ago! Finished shelves - I really wish this was all the shoes! She loved it! She's very much a girl that needs to be kept busy and doesn't like doing nothing, so a job like this was ideal. she laughed the whole time I let her use the drill, switched the hoover on and off for me, passed me everything I needed, hammered in rawl plugs, she was a great little helper really. Little girl proud of her work! 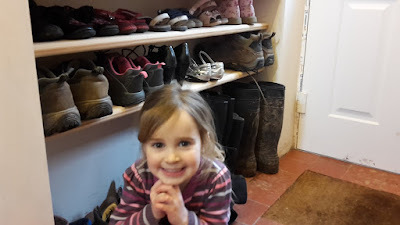 She was so proud to show everyone when they got home and I'm pleased to have more shoes up off the floor and organised! Any tips for storing hundreds of shoes? you are seriously the best dad! you teach your kids so much, especially how to be proud of themselves! Like I've said before I'm not great all the time! There are many things I need to improve on! Great job! My hubby is great at keeping the kids busy with those types of "jobs" too. The 14 year old even has his own rolling tool box (he got his pick of my Dad's tools after he passed away). But, the shoe storage does get tougher as those dangled kids insist on continuing to grow! The 14 year old is in just two sizes smaller than hubby's! My little girl has a tool kit with wooden tools that she loves and a plastic "cordless drill" that she uses to try and undo everything! Their feet will get bigger but hopefully we'll have a utility room by then as well. This is really sweet! What a great project to build confidence! I'm going to post this week about baking with my little guy. As for shoes, no. Ours are a disaster in spite of only being three of us and having a large shoe rack. Space is always an issue here, and we're naturally messy people unfortunately! Kev - you and your wife and kids are what i put all of my hopes and dreams in for the future of our world! your daughter is learning that a mom can work (or not) and a dad can work (or not) but someone will always be home to kiss boo-boos and teach how to build shelves...even if the little girl building shelves is an actual princess! i love reading your stories about what you and your family are up to! it gives me hope...i swear! No gender roles here inside the house. The garden and animals are my domain but he girls spend a lot of time out there with me. With two grandsons with us at the moment, we have shoes EVERYWHERE. I need something similar. I think this one needs to be about 12 times bigger! She was so pleased with herself, she showed them all when they got home! It's certainly not easier with them but it's good for both them and me. 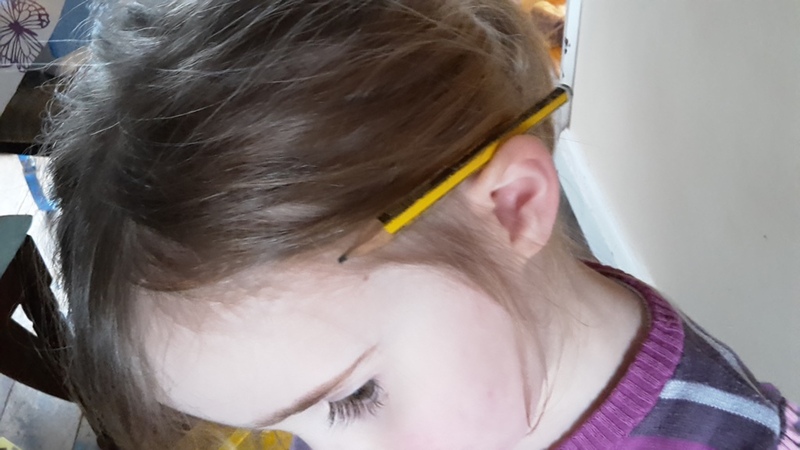 I need to be more patent with my children sometimes and this is a great way of taking my time with them and doing it slowly and right. Nothing wrong with a bit of child labour! Aww bless her, what a clever girl. We gave up on shelves for the shoes and acquired a vintage luggage trunk that they just get thrown into. I've looked at all sorts of solutions and even started making an elaborate unit our of MFD but gave up on the idea over something more simple, I think this way will work better than the one I had started anyway. I think more shelves are certainly needed ! 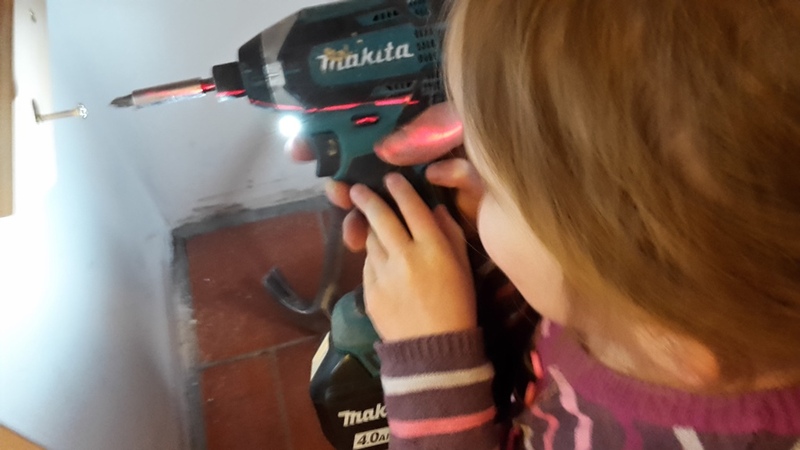 Well done for teaching DIY skills to your children! Hopefully some of them will stick! No tips for storing hundred of shoes (!) and you certainly don't need any tips for raising children in a healthy manner. Not only is your middle child actually learning life-long skills (no, she's not too young to learn and remember) but you're also building tremendous self-esteem and instilling the thought in her pretty little head that she can do anything!! It certainly gives her some self esteem, she's always proud when we do something together. Ha ha we have loads of shoes as well. Wellies are a problem. I have thought about drilling into a tree trunk and pushing wooden broom handles in (cut in half) and putting the boots on upside down on the poles. No shoes go in my house past the porch. I dont care who you are, I have slippers. We have foxes, horses, cats, birds... everything that po ops out the front door. it isnt coming in my house. At least if you keep all the shoes in the porch there will be no early morning school panic of where are the matching shoes!!! Only improvement I would have would be, out side shoes nearest the door, slippers closest to the house. but it looks pretty perfect!!! Great job! I grew up on a farm so have always had a no shoes in the house rule which we've followed to this day. It's good having young children as they have no problems telling anyone who forgets to take their shoes off! Start looking out for more and wider wood !! The shoes of course get significantly longer & wider as the kids grow. However, by then you not only have useful home shoes & hobby sports shoes/boots, but school shoes & school sports shoes (several pairs per child for gym & sports field), then come the teenage leisure shoes - for both sexes - which come in so many colours & styles (once they get an income from a weekend job the number of these purchased is exponential - and of course they often need a special pair of shoes - flat or toe cap etc for the job!). In fact forget about the extra wood - just build a new 'porch' just for storing shoes...!! This porch is new! I wish it could have been bigger but it's all planning would allow us! We need more space already when it comes to shoes and coats and it's only going to get worse! Nice shoe rack. You could make a good living here building in house things like that for people. It's this sort of thing as well as general carpentry (doors, skirting, roofs, wardrobes, etc) that is my bread and butter when I'm working here. I've not had to look for work in a while now which is nice. An Argument With James Wong Via Facebook!